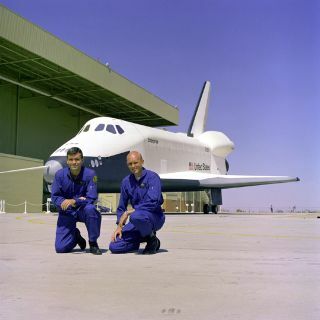 The first crew for the Space Shuttle Approach and Landing Tests are pictured with the Enterprise. In this historical photo from the U.S. space agency, the first crew members for the Space Shuttle Approach and Landing Tests (ALT) are photographed at the Rockwell International Space Division's Orbiter Assembly Facility at Palmdale, California, on Sept, 17, 1976. The Shuttle Enterprise is Commanded by former Apollo 13 Lunar Module pilot, Fred Haise (left) with C. Gordon Fullerton as pilot. The Shuttle Orbiter Enterprise was named after the fictional Starship Enterprise from the popular 1960's television series, Star Trek.